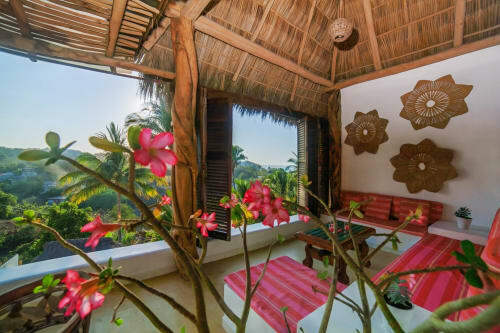 Casa Corazon de Luz in Sayulita is a uniquely beautiful vacation rental home. Nestled at the edge of the jungle, and facing out towards the ocean and town, you may find you never want to leave the house. Located on the lush, southern side of Sayulita, we are just a 10-minute walk (or 5 minute taxi ride) from town, beaches and jungle trails. The grounds are spectacular, overflowing with tropical flowers, lush palms and brilliantly colored birds. Perfect for a small group or family, with 4 bedrooms and 4.5 baths, this hand-crafted home was designed and built as a labor of love. The architecture is a contemporary twist on the traditional coastal palapa-style. The space is tranquil, organic and harmonious with nature. Walk through the entrance towards a spectacular ocean view and sparkling blue water of our large infinity pool. The spacious, serene living room, dining area and airy, fully equipped working kitchen are crowned by a three-story palapa. It is the communal space. The romantically appointed MASTER BEDROOM is at the top of a sweeping staircase, with its own separate wing, sitting area, king-sized bed with luxurious linens and a Zen-like bathroom with an open-air private shower. The other side of the house has another MASTER SUITE, with it’s own living room, king-sized bed and two decks. Upstairs is a SLEEPING LOFT with a full and twin bed, perfect for kids who will feel like they are in a tree house, but safe and sound under a palapa roof. Crossing the bridge and heading downstairs is the lovely and romantic JUNGLE ROOM. The queen-sized bed faces the jungle and partial ocean view and has an outdoor seating area and very spacious bathroom and closet. Private, peaceful and quiet. Also donwstairs is the new BLUE ROOM (Recamara Azul). The queen-sized bed looks out at the downstairs courtyard. It has a built in couch and hanging star lights and a large closet space. The bathroom is just steps away from the bedroom. The whole house enjoys the benefit of a water purification system. The salt-water pool is perfect for swimming laps or simply lounging. It can be heated upon request. Every bedroom has air-conditioning, overhead fans, spacious closets and your own safe. Our caretakers, Fabiola and Canuto will provide housekeeping six days a week. They live on-site in their own casita and are like family to Corazon de Luz. They provide warmth and security. Our fantastic house managers, Gabbi and Nick will be your liaisons, providing personal service. They will be available to make your trip to Sayulita as comforatble as possible, connecting with you even before you arrive. The house has wi-fi, iPod docks, but no television. We prefer to plug into nature, read a book and enjoy the sweetness and charm of our little village. We had an incredible week-long stay at Corazon de Luz in late March 2018. Our group of 8 consisted of 2 families of 4, with 4 adults and 4 kids. Everyone marveled at the beauty, tastefulness, and comfort of the house. The pool was beautiful and perfect, as were the common areas that were mostly outdoors. The bedrooms were spacious and tastefully decorated, and the bathrooms were plentiful and very comfortable. The location of the house was great too - up on a hill overlooking the ocean below with lush jungle views, and not far from town and the beaches, but far enough to be in your own tranquil retreat! The staff that supported the house was very kind and hard-working, and we greatly enjoyed numerous home-cooked meals that we arranged to be prepared for us. We had such an amazing time and were blown away by Corazun de Luz and by all that Sayulita had to offer as well! 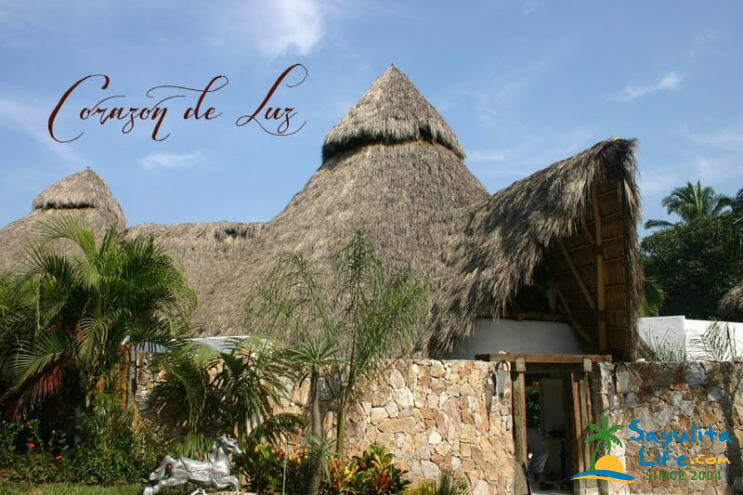 What an amazing stay we had at Casa Corazon De Luz. It accommodated all of us (4 adults and 4 children) perfectly, providing a communal area and private individual retreats. Each day upon our arrival back to the house we would all let out a genuine breath of Ahhhhhhh, the view is magnificent. The pool was perfect for our 10, 11, 12 and 13 year olds to enjoy. Fabiola and Canuto are warm kind and incredibly welcoming. It was a vacation we will not soon forget. Thank you for an outstanding week. Thank you so much for your kind words! I just arrived 10 minutes ago and let out the exact same sigh! We are so happy that your family enjoyed the house. Come on back! Corazon de Luz awaits! The house was truly amazing. It acutally exceeded our expectations which is very rare. The setting is perfect and the views are incredible! We had a blast staying here. The entire house is fantastic is set away from the town, yet close enough to run into town for food or errands (I highly recommend getting golf carts) . We loved the pool area and the views of the beach below. I would highly recommend having dinner prepared by the incredible family (they are incredible) who takes care of things while you are visiting. Thank you Jeff, for your kind words. It means so much to us knowing that you and your group could enjoy the house. We created the house for our family and friends, with the dream of having a communal space and as well as plenty of privacy. We always feel nourished by our time at Corazon de Luz, we're so happy that you felt the same. I'll pass on your kind words to the gang! Come on back! You're always welcome! The moment the doors open at this place your jaw will drop. 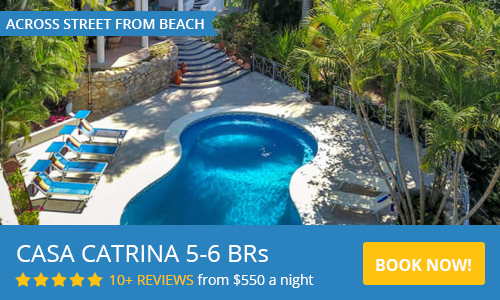 The open living room looks out over your personal infinity pool and all the way down to the beaches of sayulita. The view is breathtaking! The villa was a home away, and was our favorite spot for afternoon dips in the pool, playing games, etc. it's a huge place that very comfortably accommodates 8, plus a few children. The rooms are beautiful, each with their own private bathroom and outdoor shower. The housekeeping staff are wonderful and very courteous. Definitely recommend this spot!! Our stay here was perfect! The house was absolutely beautiful, and the entire trip was magical. We couldn't have been happier with the attentive and kind staff. We will likely return to celebrate again next year. Nicest place we've ever rented! The pictures don't do this gorgeous home justice. It is stunning and comfortable and beautifully designed. We had a wonderful time with the help of the care takers Fabiola and Cunato who not only kept the house tidy but also cooked us a delicious dinner; and the managers Gabbi and Nick(though we only met Gabbi). Gabbi knows everything about Sayulita and answered all of our questions, rented us golf carts (way more fun then having a car), reserved us cars to and from the airport, recommended a yoga teacher and more. We were well taken care of. The pictures online were very nice, but believe me, they did not do Casa Corazon De Luz justice. Everything about the house was very well thought out. The pool was the largest I have seen in Sayulita. The view every morning and evening was breath taking. The rooms large and very well appointed. The kitchen was perfect. The house keepers were beyond accommodating. Fabiola even cooked us a couple of authentic Mexican meals. My family has already told me they want to stay at Casa Corazon again. Six of us have been visiting Sayulita in January for a few years now. We had a great place nearby, but this year it was not available. We were refereed by a local resident to Corazon de Luz, and what a great find it turned out to be! The place was immaculate and beautifully appointed. They had everything we needed, including two very efficient and friendly caretakers. The location is ideal, considering we prefer to be just outside the (low) noise of the town. Its an easy walk into town, and moreover, close to our favorite beaches that are just south of the center. Excellent communication and follow up with the owners; we will certainly return. Paradise! Can't wait to return. Absolutely beautiful views, wonderful pool and other amenities at this home overlooking the coast. Very comfortable and aesthetically superior to other properties we saw while we were there. Very close to town and the beach. Would return in an instant! Had everything we needed. $400 refundable security deposit. Seven nights minimum stay during high season. 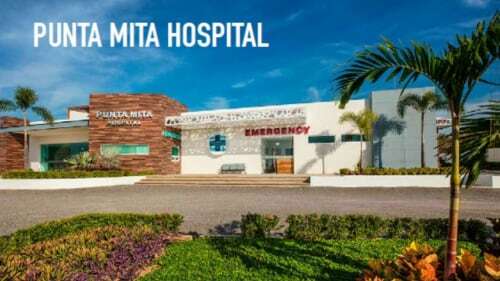 50% required for confirmation of reservation, balance due 30 days prior to arrival. Rental rate includes heated pool.